Discussion in 'World Armed Forces' started by Jeff Head, Sep 6, 2013. Not many people are aware or familiar with this awesome ocean-going assett the US Pacific Command has in its inventory. It is the largest X-Band Radar in the world, and it can travel anywhere on the oceans of the world at 8-9 knots and then remain on station for however long necessary. For Ballistic Missile Defense, it is truly an incredible vessel and engineering feat. 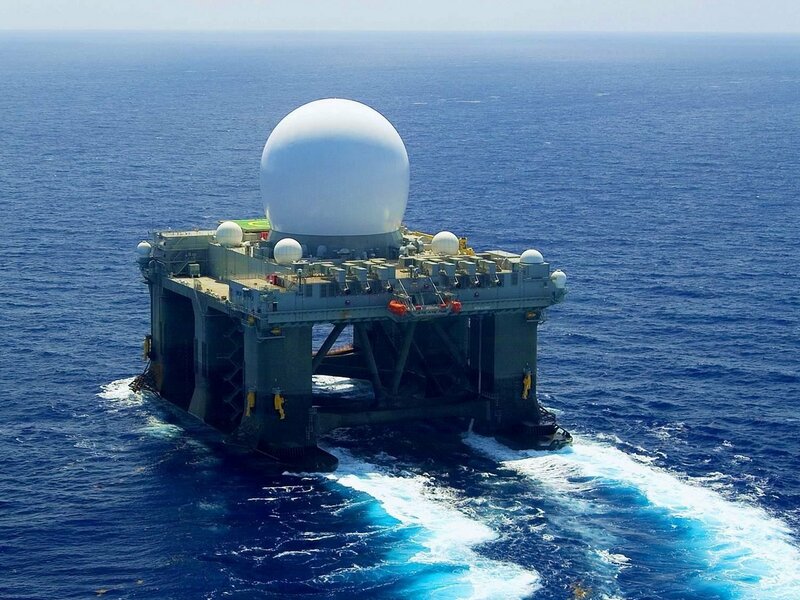 The Sea-Based X-Band Radar (SBX-1) is a floating, self-propelled, mobile radar station designed to operate in high winds and heavy seas. It is part of the U.S. Defense Department Missile Defense Agency (MDA), Ballistic Missile Defense System (BMD) and is mounted on a fifth generation CS-50 twin-hulled semi-submersible drilling rig. 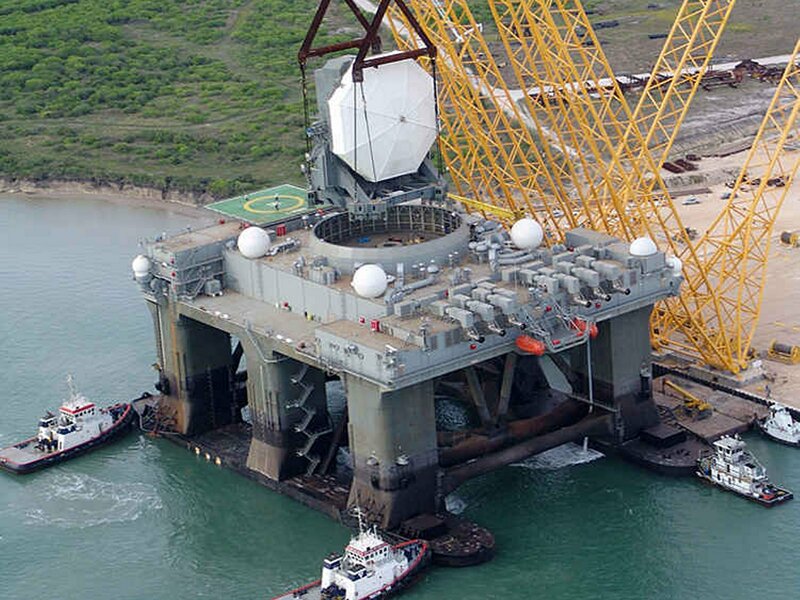 Conversion of the vessel was carried out at the AmFELS yard in Brownsville, Texas; the radar mount was built and mounted on the vessel at the Kiewit yard in Ingleside, Texas, near Corpus Christi. 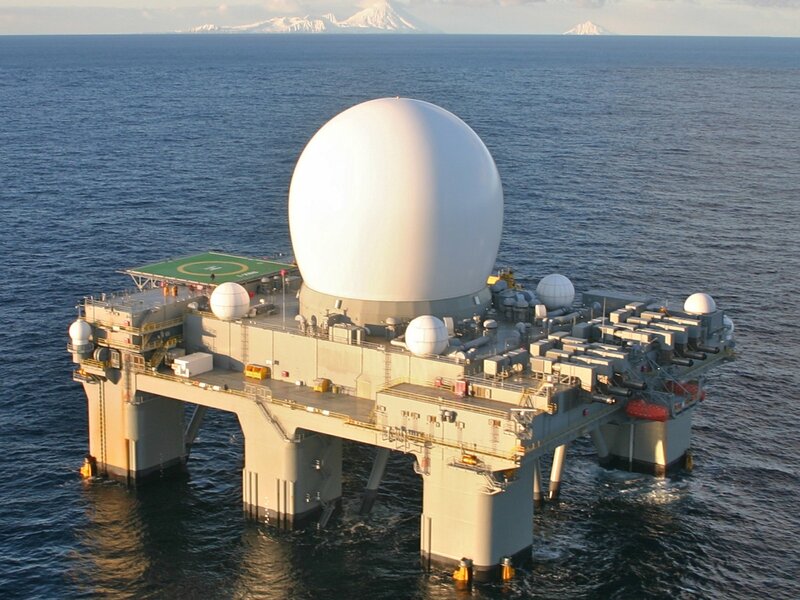 It is meant to be based at Adak Island in Alaska but can roam across the ocean to detect incoming ballistic missiles. In January 2003, the United States government purchased a semi-submersible 50,000-ton seagoing platform from Moss Maritime, a Norwegian company specializing in special purpose offshore vessels and platforms, for use in the Missile Defense Agency’s (MDA’s) layered Ballistic Missile Defense System (BMDS). 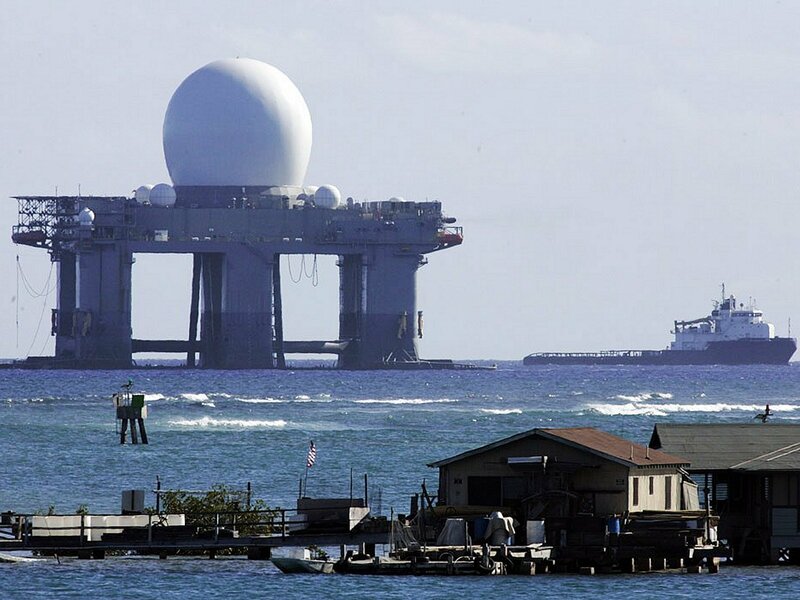 largest X-band radar onto the platform at Kiewit Offshore Services in Ingleside, Texas; and additional modifications at Pearl Harbor Naval Shipyard in Honolulu, Hawaii. contains a command, control and communications system and an Inflight Interceptor Communication System Data Terminal. 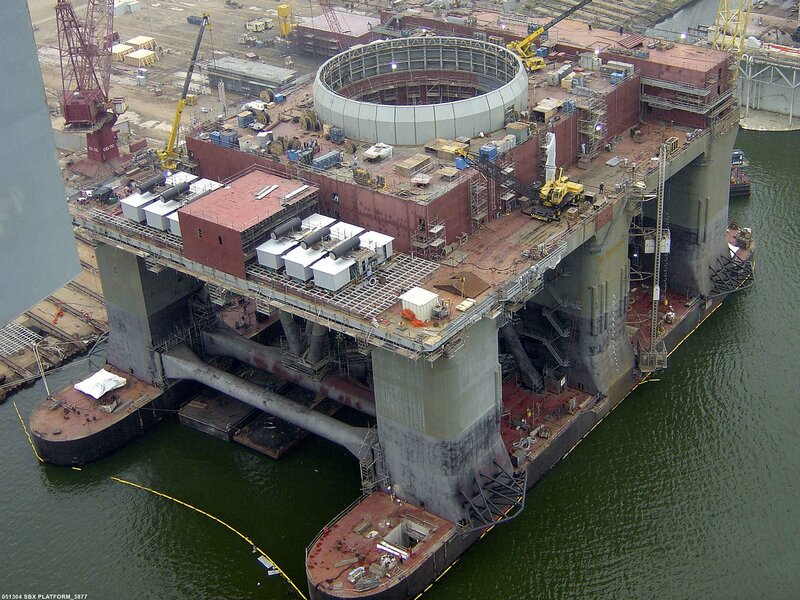 The platform maintains 60-days of supplies and fuel. As stated, the SBX-1 system is part of the Ground-Based Midcourse Defense (GMD) system being deployed by the MDA. Being sea-based allows the vessel to be moved to areas where it is needed for enhanced missile defense. Fixed radars provide coverage for a very limited area due to the curvature of the Earth. The primary mission of the SBX is the discrimination of actual enemy warheads from decoys, followed by precision tracking of the identified warheads. The vessel has many small radomes for various communications tasks and a central, large dome that encloses and protects a phased-array, 1,800 tonne (4,000,000 pound) X band radar antenna. The small radomes are rigid, but the central dome is a non-rigid system where the cover is supported by positive air pressure. The amount of air pressure is variable depending on weather conditions. The radar antenna itself is 4,130 sq ft. It has numerous solid-state transmit-receive modules mounted on an octagonal flat base which can move ±270 degrees in azimuth and 0 to 85 degrees elevation (although software currently limits the maximum physical elevation to 80 degrees). The maximum azimuth and elevation velocities are approximately 5-8 degrees per second. In addition to the physical motion of the base, the beam can be electronically steered off bore-sight. There are over 22,000 modules installed on the base. Each module has one transmit-receive feed horn and one auxiliary receive feed horn for a second polarization, so there close to 45,000 feedhorns. The base is roughly 2/3 populated, with space for installation of additional modules. The current modules are concentrated towards the center, so as to minimize grating lobes. This configuration allows it to support the very-long-range target discrimination and tracking that GMD's midcourse segment requires. The array itself requires over a megawatt of power to operate. 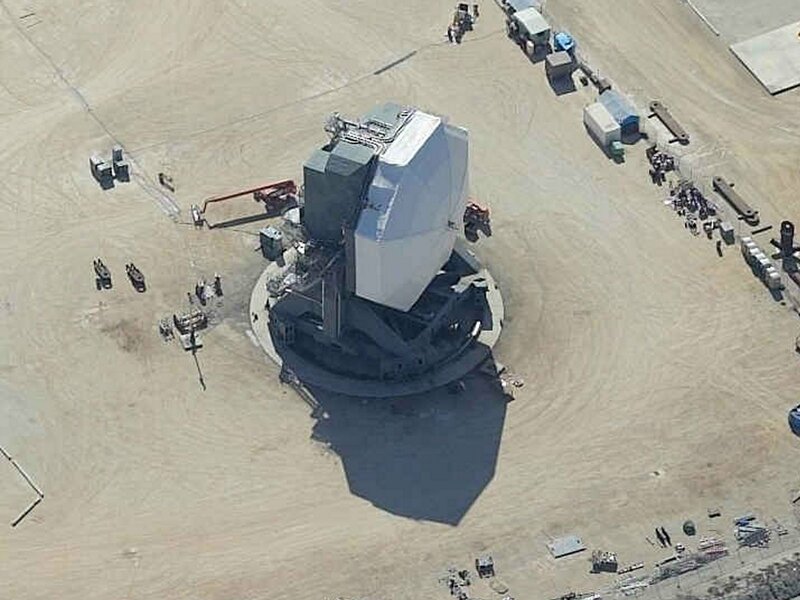 This active electronically scanned array radar is derived from the radar used in the THAAD theater ballistic missile defense system, and is a part of the layered BMD program of the United States Missile Defense Agency . An important difference between SBX and the Aegis radar system used by the US NAvy is the use of X band radar. Aegis uses S band. For comparison, the Patriot land-based missile system uses the higher-frequency C band. The X band frequency is higher still, so its shorter wavelength enables finer resolution of tracked objects. The radar is designed and built by Raytheon Integrated Defense Systems for Boeing, the prime contractor on the project for MDA. 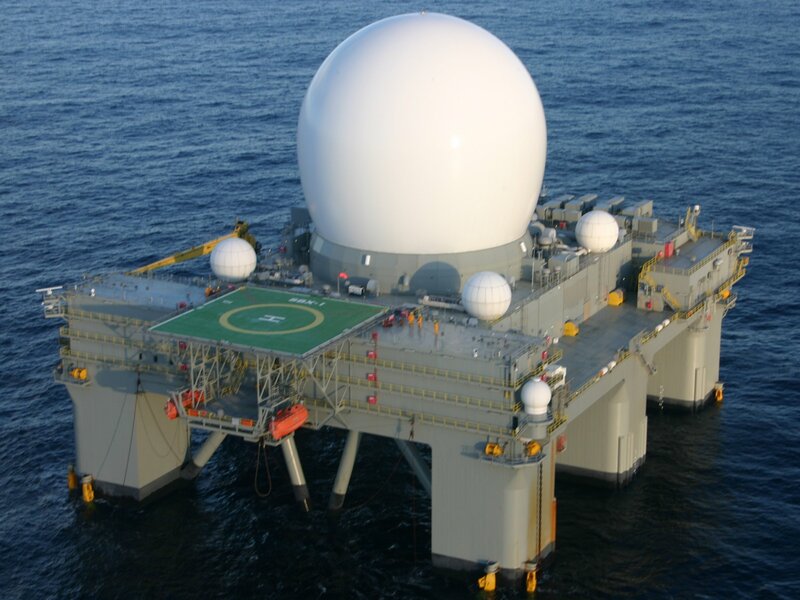 The radar has been described by the director of MDA as being able to track an object the size of a baseball over San Francisco in California from the Chesapeake Bay in Virginia, well over 2,500 away. The radar will guide land-based missiles from Alaska and California, as well as in-theatre assets. SBX-1 is home based at Adak Island, Alaska, part of the Aleutian Islands. From that location it can track missiles launched toward the US from both North Korea and China. Although her homeport is in Alaska, she will be tasked with moving throughout the Pacific Ocean to support her mission. - The SBX-1 serves as the largest and most sophisticated phased array electro-mechanically steered X-band radar in the world. Steering electronically within its field of coverage and mechanically in azimuth and elevation allows the radar to track a full 360 degrees in azimuth and about 90 degrees in elevation from near the horizon to the zenith. As a result, the radar can track objects as they fly toward, over, and away from the vessel. - Approximately 45,000 transmit/receive modules in the radar operate together to form the radar beam, which is capable of seeing an object the size of a baseball at a distance of 2,500 miles. Each module consists of the final transmit stage and initial receive stage from each antenna element. The radar also uses 69,632 multi-sectional circuits to transmit, receive, and amplify signals. - The SBX-1, which is capable of traveling 9 knots under its own power, measures 240 feet wide, 390 feet long, and 280 feet high from its keel to the top of the radar dome (radome). - Air pressure alone supports the radome that surrounds the radar. The radome weighs 18,000 pounds, stands more than 103 feet high, and measures 120 feet in diameter. Moreover, the high-tech synthetic fabric allows the radome to withstand winds in excess of 130 miles per hour. - The SBX-1 crew includes approximately 86 officers, civilians, and contractor personnel to carry out its mission. - In addition to the inherent stability of the vessel, the radar itself provides electronic stabilization of the radar beam to continue mission operations as the vessel responds to changing sea conditions. - The marine diesel fuel capacity of the SBX-1 is 1.8 million gallons. The was 1st deployed in 2006. The ship has received upgrades and maintenance at Pearl Harbor, Hawaii several times since. This includes 170 days in 2006, 63 days in 2007, 63 days in 2008, 177 days in 2009, and 51 days in 2010. When not at Hawaii, the SBX has been on operational deployments in the Pacific, including traveling to waters off Alaska. A $26 million, eight-point mooring chain system was completed for her in 2007 in Adak's Kuluk Bay. On June 23, 2009, the SBX was moved to offshore Hawaii in response to a potential North Korean missile launch. Between 2009 and 2010, the vessel spent 396 continuous days at sea, which is a significant, long-term deployment for any military vessel. In May 2011, the SBX-1 entered Vigor Shipyard (formerly the Todd Pacific Shipyard) in Seattle for a $27 million upgrade and maintenance work by c Boeing. The work was completed in three months and in August 2011, SBX-1 departed Seattle for her next deployment. In April 2012, SBX-1 left Pearl Harbor to monitor North Korea's planned Unha-3 missile in the launch window of 12–16 April 2012. The vessel returned to Pearl Harbor on 21 May 2012. It redeployed to monitor the next North Korean launch attempt at the end of 2012. In April 2013 SBX-1 was again deployed to monitor North Korea. Bernard and Jeff Head like this. It can data link and otherwise communicate its tracking information tp those interceptors either in Alaska or in California, or to AEGIS BMD vessels in the Pacific...particularly off the coast of N. Korea. Although not Sea based, the US Military operates a X-band radar installation JTAGS(Joint Tactical Ground Station) in Misawa, Aomori from 2007. JASDF operates a similar radar system J/FPS-5 in the L/S band range dubbed Gamera Radar due to it's 18m diameter vertical dome covered with interlocking hexagon panels. There are four installations constructed in Japan. The radar data is sent to Air Defense Command Central BMD defense unit for monitoring and issuing nationwide warning through J-Alert system. Yes, the Japanese have developed a very decent coverage in this regard. Of course, they face a very imminent threat and need it. With these radars and the appropriate defensive weaponry (lie the BMD equipped AEGIS vessels) all linked together, it helps to counter that threat. The big story over the weekend. mainly about problems with the SBX radar. This has already been addressed...please do a search before posting something that has already been covered like this. This is progressive/liberal hype and represents a complete lack of real journalism and a classic example of reporting for the sake of an agenda. So, I will respond again to this rediculous assertion. As one who worked on THAADS back in the 1990s before Clinton cancled it (and then was revived and completed under Bush) I am familiar with the effort all around. These cutting edge programs are indeed expensive. But the US has developed and deployed several very effective missile defense systems precisely because it had the money and the will research and... test them. Yes, there have been failures, but they too have added significantly to the knowledge base and themselves helped produce very effective, working systems that have been successfully live fired tested scores and scores of times. The ABM interceptors now deployed in Alaska and California work. The AEGIS BMD system works and is deployed on many AEGIS vessels and is being deployed on land...allied nations are buying both. THAADS, a theater level system is deployed and works and is being purchased by others. The Patriot system is deployed and works and is also operated by our allies. These systems did not come to be by magic. It takes that type of research and development and spending and testing to develop them. Soon at sea lasers and rail guns will be working.They are schedule to be deployed on vessels at sea...and the research, testing, and even failures that went into earlier programs has brought them forward. So the idea that it was a waste, or a failure in policy and research is just so much hooey and baloney...and (IMHO) also what it really is is a thinly veiled effort to try and get them stopped. SBX is not about THAAD. when did LA Times become a "liberal" newspaper? of course there is an agenda, but it is not what you think. It is not my intention to get into a drawn out, detailed discussion on this. Quite frankly some things I am not a liberty to discuss. I can say that THAADS however, is a part of the layered "shield," and has benefited from former programs significantly...and has itself brought the technology forward. It had been doing that already in the 1990s. In my experience, on this program and others, I have seen how various factions (press, politicians, etc.) seek to change, naysay,reduce and cancel such programs. So, although there may well be more than one agenda, the reporting in that article is very swayed and leaves out critical issues like I addressed in my earlier response. And the conclusions of the article speak for themselves...and they do not paint a picture of how those efforts it derides contributed significantly to today's successful results..
My point is simple...the money has not been wasted, and the effort does not represent a failure in policy...even though some programs were canceled. This is what it takes to bring such technology forward. I'll leave it at that, and with that.we have both responded equally and now readers can draw their own conclusions. SBX is used by that article, to attack US efforts and spending in the area of missile defense. THAT is what the article is about. The article goes into some detail about other efforts, and uses most of its content to decry efforts ot establish such defense. As I have said, they are expensive. Many of them have had their problems. But they are by no means a waste or a failure overall. The fact is, all of those programs, including SBX, have benefited our understanding, knowledgebase, and technology, and those things have led to successes elsewhere. As far as SBX is concerned, it was never meant to be a "fighting," or "combat" ship. It was meant to provide advanced warning of rouge state launched ballistic missiles that could threaten American interests, and it was meant to give us a much better understanding of X-Band radar and the ability to use it in such a system. Anyhow, I have said my piece...enough said. Bernard and Jura like this.